Raw Women's Champion Ronda Rousey will officially defend her title against Nia Jax at WWE TLC. Rousey vs. Jax was announced for the December 16 pay-per-view in San Jose, California during tonight's post-Survivor Series episode of Raw. This will be the second televised match they've had against each other. At Money in the Bank, Rousey defeated Jax by disqualification when Alexa Bliss interrupted their match. 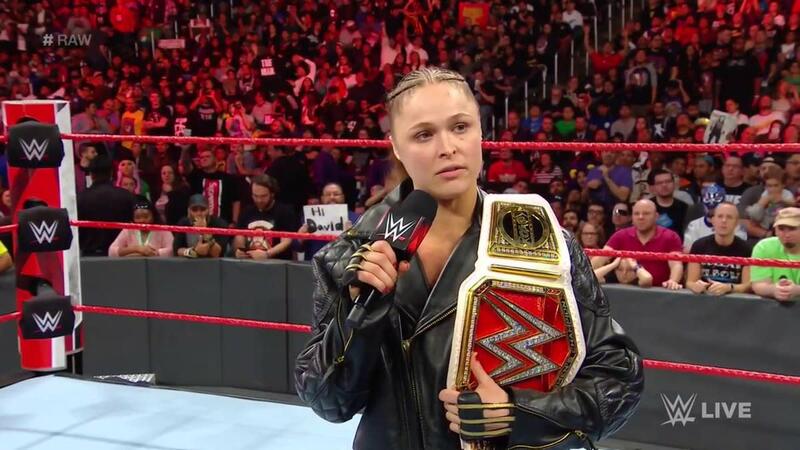 After facing Charlotte Flair at Survivor Series, Rousey made an appearance on tonight's Raw. She cut a promo where she vowed to submit Jax at TLC and then find Charlotte and finish what they started. Rousey talked about what it means to be a true champion, with the storyline leading to her issuing an open challenge. She retained her title by submitting Mickie James. Jax & Tamina defeated Bayley & Sasha Banks on Raw. Rousey vs. Jax, Braun Strowman vs. Baron Corbin in a tables, ladders, and chairs match, and Seth Rollins defending the Intercontinental Championship against Dean Ambrose have been confirmed for TLC.